Lawton is a trial and appellate lawyer. 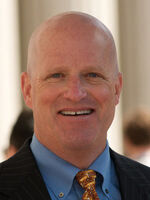 He practices in the federal and state courts, mostly in San Diego. Each day, the news media confront us with a new, bizarre permutation of Americans' incivility to one another. One of the fun parts of being a lawyer is watching law, cutting-edge technology and capital markets intersect in ways that produce big changes in how we live, work and play. The most fascinating such intersection I’ve seen in my career is happening here in San Diego. Attorney Johnnie L. Cochran, Jr. died 10 years ago. A brain tumor took him out at the age of 67. The mainstream media remembered him as O.J. Simpson’s lawyer, who had gotten an improbable acquittal for his notorious client in the spectacular double-murder trial in Los Angeles in 1995. It’s been 25 years since Nelson Mandela walked free after 27 years of imprisonment in South Africa. Today, in San Diego, one wonders what value any writer could add to the ocean of ink spilled about Mandela down the years. To me, each April marks a special time — the beginning of another baseball season. But there is something slightly different this spring — it marks the 40th anniversary of an event that had a deeper impact on the game than anything that ever happened on the field. That event was the dawn of free agency for major league players in 1975. Tim Atkins is an African-American man from Los Angeles. He is humble, gentle and well-spoken. He is 47 years old today and a free man. For 20 years, he lived in state prison, after a jury convicted him of murdering Vicente Gonzalez in 1987. Atkins was innocent. The California Innocence Project, working pro bono, proved it in February 2007. If you're like me, you filled out an NCAA men's basketball tournament bracket last week. March Madness is about dreams and escape. For competition, drama and pageantry, no sports tournament in America beats the Big Dance. I'll be watching.